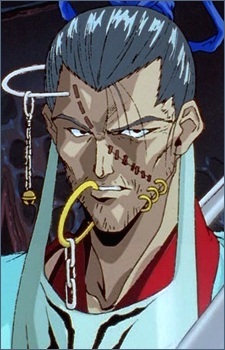 Shigure the Osteopath is a demon surgeon who implants Hiei with his Jagan eye. Shigure charges his customers with weird requests, such as an "interesting story" or a promise, rather than money. After implanting Hiei with the Jagan eye, Shigure trains Hiei as a swordsman, warning him the other demons will attempt to find and kill Hiei once they learn he has weakened. After Hiei leaves, Shigure has Hiei promise to never tell Yukina that she is Hiei's sister, though Hiei doesn't plan on it. He later fights Hiei for the 76th spot out of 76 positions under Mukuro's direct command. He has his head sliced in two, though Mukuro manages to save his life afterward. He then fights Kurama in the Makai tournament, but loses.